The world of wine is full of the unexpected. We bring you some of our favorite surprises from near and far along with stories about Drum Roll Wine. Anticipate every glass! I have a theory about Japanese culture. Like most of my opinions and perspectives, it’s only partially informed. I’ve spent some time in Japan on a handful of trips in the last few years, but I’m no scholar. In fact, my theory started developing before I had ever even visited the Land of the Rising Sun. It began when an enthusiastic shop keeper at a high-end liquor store in Manhattan convinced me to purchase the Japanese malt whisky Nikka. Being a fan of proper Scotch, I was skeptical. Once I tasted it, however, I started to wonder if there’s anything the Japanese can’t do. And do well. (In other words, it was NICE.) The deeply ingrained societal values of propriety (doing things the “right” way), patience (proceeding slowly and carefully in the pursuit of excellence), and the quest for perfection (or at least constant improvement) add up to so many remarkable aspects of Japanese culture. So on a couple of recent trips to Japan, I put my theory to the test by exploring Japanese wine. Not Sake (which is actually brewed like beer but colloquially referred to as “rice wine” in Western cultures), but actual glorious fermented and aged grape juice. If they take such good care of table grapes, imagine how the Japanese look after wine grapes! Yamanashi prefecture is the traditional home of Japanese wine. With 80 wineries in operation, over 40% of all Japanese wine today is produced in this district. To warm up for my first visit there, I began at Y Wine, a restaurant in Tokyo featuring an extensive selection of Japanese wines. The proprietor is the highly-regarded Japanese sommelier Tasaki Shinya, and the food features ingredients from the Yamanashi region. The dining experience was a good reminder that in addition to propriety, patience, and perfection, the Japanese are also well versed in presentation. Each dish was elegant and beautiful to behold. Not to mention delicious. Even a simple salad is a visual treat in Japan. The leading star of the Japanese wine show is the Koshu grape. Similar in color to Pinot Gris on the vine, it has its roots in the Caucasus region (around modern-day Georgia) and traveled to the far east via Silk Road trade perhaps a thousand years ago. The grape mutated naturally with local varietals and was recently determined to be about 72% vitis vinifera (i.e., the European species enjoyed in the form of Chardonnay, Cabernet Sauvignon, Merlot, Pinot Noir, and so on). Y Wine features an extensive list of Koshu wines. A sparkling Koshu from Manns Wine, for example, presented fine bubbles, notes of pear, and was an excellent companion to the appetizer course. My first Japanese wine was a sparkler. a good way to start just about anything. Koshu on the vine in Yamanashi. There were many wines on offer at my first Japanese wine dinner so I simply allowed my host to make the selections. A still Koshu from Katsunuma Winery was reminiscent of tree fruit (apple and pear) as well as white flowers with a pleasant mouthfeel from the “sur lie” production (in which the wine is aged along with expired yeast cells from the fermentation process, thus adding body to the final product). Another Koshu from Ikeda Winery had plentiful acid (i.e., tartness) similar to a dry Reisling. I’m a big fan of dry, high-acid, low-alcohol wines and these Koshus really delivered. So much Koshu, so little time. Guess what else I tried. That's right, Koshu! Our dining party ended the night with a Japanese take on Merlot and another red wine called Muscat Bailey A (a name so awkward that only a scientist could have devised it). The Merlot was light in color and body (surprisingly, it reminded me of Pinot Noir in some respects) and the Muscat Bailey A was a bit like a Gamay with a gorgeous bright ruby color and pronounced aromas and flavors of red fruit (raspberry, cranberry, and strawberry). It was not especially subtle but was a pleasant-enough way to cap the evening. The next morning, I boarded an early train from Tokyo’s famous Shinjuku station for the town of Katsunuma (formerly known as Koshu) and enjoyed an easy 90-minute trip ascending toward the sleepy, mountainous region of Yamanashi. It was a clear day in early March with views of Mt. Fuji in the distance. The town sits at about 600 feet elevation and is surrounded by mountains on all sides (the train passed through several tunnels built into the mountains along the way). 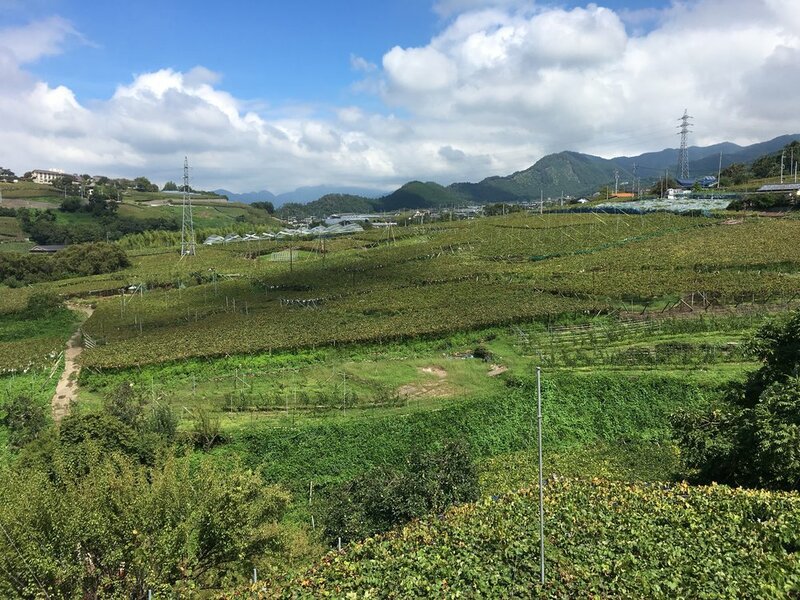 While vineyards nearly cover the valley floor, there are also elevated vineyards around the edge of Katsunuma. It’s a cool climate region where grapes can be harvested anytime from early September to late October depending on the vineyard site, grape varietal, and specific weather conditions that year. On a subsequent mid-September visit, I was pleased to see ripe grapes hanging in anticipation of harvest. This is a solidly cool climate wine region. There are old vines and there are old vines. This town is absolutely covered in vines. Like “Old World” grape growing regions, vines and everyday life are intertwined in Katsunuma. After walking through the village intrigued by the unique trellising method of the many vineyards (a variation of the “pergola” method used in parts of Italy and elsewhere, it’s intended to create maximum airflow for the vines during humid summers), my first stop was Château Mercian where I tasted through a quartet of Koshu wines in a uniquely Japanese setting. Some of these had grassy characteristics similar to Sauvignon Blanc and all were highly acidic (a beneficial palate cleansing aspect of lighter bodied wines). Château Mercian also houses a museum of local wine making dating back to 1873. I couldn’t read the Japanese descriptions, but the historic artifacts were interesting to view. The Japanese take on Pergola trellising. There is some serious infrastructure behind the grape growing here..
Vine cultivation dates to the late 19th century in Katsunuma. Some of the many artifacts on display at a regional wine museum. A lovely tasting through Koshu styles at Château Mercian. Not your everyday tasting environment. This Montrachet-style Chardonnay is complex and delicious. The centerpiece of my excursion into Japanese wine territory was a scheduled visit with the talented and accomplished head winemaker at Grace Wine, Ayana Misawa. With wine studies in Bordeaux and production experience in Alsace, Burgundy, New Zealand, and elsewhere, Ayana has an impressive breadth of knowledge and perspective. She hosted me for an extensive tasting through a selection of the winery’s best offerings. We explored five distinct Koshu wines together: a regional wine made from the grapes of various vineyards of clay soil on the valley floor; a village wine made of grapes from the better unnamed vineyards around town; a single-vineyard wine from an elevated (1,600 feet) vineyard of granite soil; a barrel-fermented single-vineyard wine; and the flagship single-vineyard Koshu wine from a vineyard at 2,300 feet elevation with slate soil. The wines showed Koshu’s high acid, low alcohol (around 11.5%) nature along with aromas and flavors of white peach, white flowers, and citrus. Each wine was somehow both more expressive and more delicate than the one before it. Tasting through them all in one setting with the winemaker was a delight and a privilege. Hospitality (and an open door) at Grace Wine. A delicious single vineyard Koshu from Grace Wine. White flowers, white peach, and lots of mouth-watering acid. Ayana also shared a Cabernet Franc and a Bordeaux blend (55% Cabernet Sauvignon) which were both technically sound if not quite typical. They showed a little of the herbaceous and green vegetal characteristics one might expect from these varietals grown in a cool climate. We ended with the previously mentioned local favorite Muscat Bailey A, a simple fruity wine benefiting from blending with Cabernet Sauvignon and Merlot. Haramo winery knows how to make a fine bottle of Koshu. Lunch at a quality winery is a pleasure. Any country, any culture, any time. After such incredible tastings of Koshu at the likes of Grace Wine and Haramo Winery (pictured above), I was ready to pronounce my theory of Japanese excellence in all endeavors without dispute. There was just one more stop on my Katsunuma adventure, the “wine cave” at the tourist magnet Budo no Oka (“Grape Hill Center”). For about 10 US dollars, visitors can try a selection of dozens of local wines. With a clear emphasis on quantity, I was concerned that the quality of the wines on pour would be disappointing, but I wanted to try a few more red wines from the region to see how they compared in caliber to all the excellent Koshu I'd enjoyed. In retrospect, I probably should have walked straight to the train station. These red wines blew a barrel-sized hole in my theory of Japanese quality. Muscat Bailey A, Cabernet Sauvignon, Merlot, Syrah, and Kai Noir (a locally cultivated hybrid grape) were overly fruity, insipid, and sometimes reminiscent of the “foxy” quality that wines made from native grape varietals in America can display. In fact, I discovered that there are plenty of American hybrids (e.g., Delaware and Black Queen) used at even the best wineries in Katsunuma. While the local customer base may appreciate these wines, they’re unlikely to contribute to any worldwide acceptance of Japanese wine. Hey kids, friends don't let friends drink at the Wine Cave! So what to do with my theory? In spite of some very disappointing red wines, I’m not quite ready to let go of my assessment of Japanese culture. It is a more nuanced view as a result of my excursion into Japanese wine, however. Gardens, automobiles, education, electronics, and culinary expression notwithstanding, I suppose it’s unrealistic to expect the Japanese (or any other population) to be able to do everything well. But with extreme attention to detail woven through so many aspects of Japanese culture, it’s not surprising to find world class white wines there. I also suspect that red wine production of cool-climate international varietals (Pinot Noir, anyone?) will improve over time in Japan and eventually be ready to play on a world stage as well. I’ll be anticipating that. You might find us drinking beer with sushi but we do love a good wine surprise. Have one to share? Email us! I can’t begin to explain the Japanese proclivity for hot dogs, but I’ll take this pairing any day. This pretty much sums up my feelings about Koshu.